Faucher Romain here presents us a video of the latest performance of Le Scaphandrier (The Diver) by the French mechanical marionette street theater company Royale De Luxe. 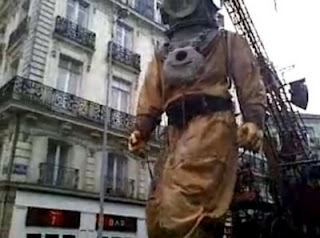 If the Little Girl Giant weighs in at 42 ton and the Diver appears to be more than three times larger we may begin to appreciate the enormity of the project and be amazed at the spectacular nature of maneuvering such a huge puppet around in public domains ! See more pictures of how the giant mechanical marionette is moved about.